Free VS Self Hosted Blogs for Business: What should you do? The follow blog post is a response to Self Hosted Blogs for Business which is paraphrased in the quote below, taken directly from the site. Do you agree? Where is your business blog hosted? Please weigh-in with your thoughts in the comments! WordPress.com and Blogger Blogs are hosted and essentially controlled by WordPress and Blogger web sites. They are free to use and very quick to set up, you can be Blogging in minutes. However, from a business perspective that is where the benefits end. Wow. While there are some very GOOD reasons for businesses to use self hosted blogs here, I strongly disagree with your this stand on using self vs free blogs for business. Especially considering small to medium sized businesses, your very short list of benefits is not at all where the benefits end. There are many more good reasons for businesses to consider using free community blogs including: cost effectiveness (from so many areas), content testing, free SEO (yes SEO) and free relevant promotion within passionate blogging communities, just to name a few. Big or small, if you don’t need to serve ads and your primary reason for blogging is organic SEO, a free blog may be ideal. A self hosted blog may be overkill. Design? Yes, self hosted blogs offer more and better options, but most business only need to be sharp, functional and professional looking with basic stats for tweaking content. With a little time and effort… and maybe a little help, coaching and finesse, you can absolutely achieve this via Worpress.com (for example). Your going to need a log more time and resources available to deal with a self hosted blog. Stats? Yes, there is absolutely better information available on self hosted blogs but that doesn’t mean you need them or you’re going to use them. If you’re driving traffic to your website, in many cases the stats supplied by the free blog combined with your website stats, that are hopefully provided by Google Analytics or better, will suffice. You CAN move to a self hosted blog later. Choice between free and self hosted should be based on what’s appropriate for your strategy and not based on bells and whistles. More often than not, bells and whistles just create more noise. Lose focus and customers get the wrong message from your new media marketing! FOCUS is the number one obstacle you will face in any “new media,” web or social networking project be it company wide tweeting or starting a Facebook fan page. Without focus businesses “forget” to update websites, they post links customers don’t care about and generally send mixed messages. It’s no coincidence focus is also the number one obstacle in any marketing project! Everything your company does involving new media – even the content – is marketing and the possibilities are endless so it’s very easy slip off track. Find out WHERE and WHAT your customers are doing online. A quick survey can tell you a lot! You can ask your customers as they walk in the door, hand out a short questionnaire, cold call them or whatever is appropriate for your business! Ask about websites they visit like Facebook or Youtube. Ask them how you could serve them better by being there too! CUSTOMIZE it for your biz! 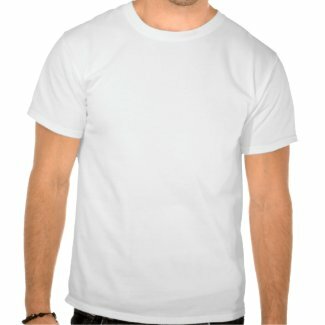 @ourbiz tweets u right white tee for Men or Women. Also available various colors and in long sleeves. Is your brand loud and fun, like the t-shirt above? Use your brand’s “personality” as a guide for what you should post on Twitter or Facebook. A comedy club might post jokes when a Lexus dealership would not. While B2B might connect with customers via Linkedin.com, everyone should consider starting a “brand” account on Twitter in which you only post business related updates, successes, discussion and events. Facebook is an exceptional place for small business owners to connect with customers as “friends” to exercise your personal brand. Everyone wants to know the owner! Make a plan. Check it, tweak and repeat. You never really know what any given moment will bring, so executing a plan might be just be your biggest challenge! Whatever you decide to do, make sure you sit down with the calendar you really rely on and schedule it! Schedule daily or weekly updates for Facebook, plan out the next 3 months worth of recipes for your blog. Keeping the plan simple and making it a priority will improve your chances for success tenfold. Create ways to measure your success so you cannot fail! If you were to create a goal to get your regular customers to be your friends on Facebook by sending them email invites you should check your progress in a month or so. If your efforts are stalled tweak your approach. Consider handing out social media business cards, direct mail or contesting. The point is, keep on eye on your progress and tweak it if it isn’t working. Need help with your online product, projects or marketing? There are many free programs available for scheduling tweets and Facebook statuses and there are ways to have your social media sites monitored (for free) as well. If you cannot be active on the sites, please seek out other solutions because at the minimum you should be reasonably “accessible.” If you are asked questions or worse, taken to task, you need to be aware and you need to respond! If you need help, there are a lot of resources “out there” that are very cost effective and you’re welcome to shoot me an email or begin a discussion right here in the comments.